This interview with Yamaguchi Sensei, one of the leading Japanese instructors in Karate-do and Head of the International Department of JKS, tells the story of his struggles and pursuits for Budo Karate. He remembers about the experiences of being taught by such a 'powerhouse of teachers', the training in the course, and the road he now follows in JKS under Kagawa Shihan. This interview was conducted by Arijit Chakraborty, 5th Dan - National Special Correspondent of WMA exclusively for the World of Martial Arts, in January 2017 at Kolkata, on the sidelines of the JKS India Karate Camp & Championships. (Arijit Chakraborty) Sensei, Oss, Welcome to India! Please tell us how you were first introduced to Martial Arts and what was it about karate that initially drew you? (Takashi Yamaguchi) Thanks, Oss! When I was young, I simply wished to be a strong man and joined a Karate club near my home in Japan when I was 8 years old. I practised hard and developed a keen interest in JKA Karate. I was fascinated by the discipline, power and beauty of karate techniques. Later, I went to Teikyo University and practised in JKS. (AC) Sensei, what is your experience of Asai Shihan, founder of JKS? (TY) He is a special person for me. Asai Shihan had great fighting spirit and superfast techniques. He taught us unique style of kata, circular techniques and whiplash movements, which have deep penetrating power and kime. I remember, in 2005 when he was very sick, suffering from cancer, we went to US and Mexico for seminar, he was advised to rest in hospital, but he ultimately went back to the dojo to teach. An outstanding Budo Master. He had a small frame by height, but had a large heart and did continuous research to devise the spinning techniques and so many new kata - like Junro kata. (AC) Sensei, what is your opinion of JKS India? (TY) Firstly, I love Indian food, weather and people. It’s my 3rd visit to Kolkata. JKS India students are showing good spirit and trying hard for good technique also. I am happy. (AC) Sensei, please share your thoughts on Olympic karate? (TY) I am happy for that, for karate to become more popular. But you see, strong traditional karate is a must. Sports karate is just one small part of total karate. See, JKS karate is combination technique, WKF Karate is continuous technique. (AC) Sensei would you please give us an idea of the type of classes you conduct at the JKS honbu? (TY) You see, Kagawa Shihan is an unique charismatic leader, he is very serious on karate matters. At JKS, we focus on strong basics also we encourage young students to participate in JKF events. We believe - keep techniques simple but effective. We also review the combat effectiveness of open hand techniques, developing a variety of techniques to suit different body types, age and strength, for example for a 55 year karate-ka, jodan-level keri waza may be challenging. At the Honbu, we do weight training, running, push ups, stamina building techniques etc. Kagawa Shihan taught me not only karate but also success principles of life. He says that karate-ka should be straight and direct – no hide & seek. He is committed to the continuous growth of Karate. (AC) Sensei, Who took the sessions in the Instructor’s Class at JKS in early 2000? (TY) Classes were conducted by Asai sensei, Abe Sensei, Isaka sensei and Yahara sensei most often, also Kagawa sensei and Tamang sensei were the instructors. Yahara sensei was too dangerous! Me and Kosho Kanayama Sensei were batch mates. I met Kagawa shihan at Teikyo university and have now been practising with him for 32 years. (AC) Sensei, who are the upcoming instructors in JKS Japan? (TY) Let’s see. Me and Kanayama are from the same batch , old friends! Inada sensei is 12 years our junior, also upcoming are Saoru Okamoto, Arimoto and Katsumata doing good. And Hideyoshi Kagawa is strong young instructor. (AC) Sensei, what is your plan for the expansion of JKS? (AC) Sensei, what are your favourite techniques and kata? (TY) My favourite technique is ushiro-geri ( back kick), my loved kata was Unsu, now its Junro and Kakuyoku kata. (AC) Sensei, your message for instructors? (TY) Older instructors may not have great stamina or strength due to age, but please ‘try’, if you cannot perform great techniques, its ok, but first try hard, don’t give up. Asai Shihan used to say - ‘karateka should train continuously till death’. (TY) You are very welcome. 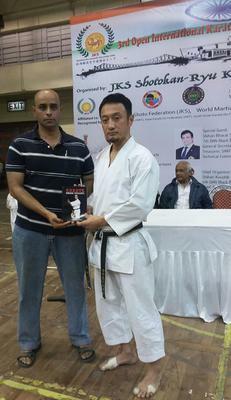 Thanks Arijit San for meeting me and please feel free to visit our Honbu dojo at Sugamo, Japan. Oss.